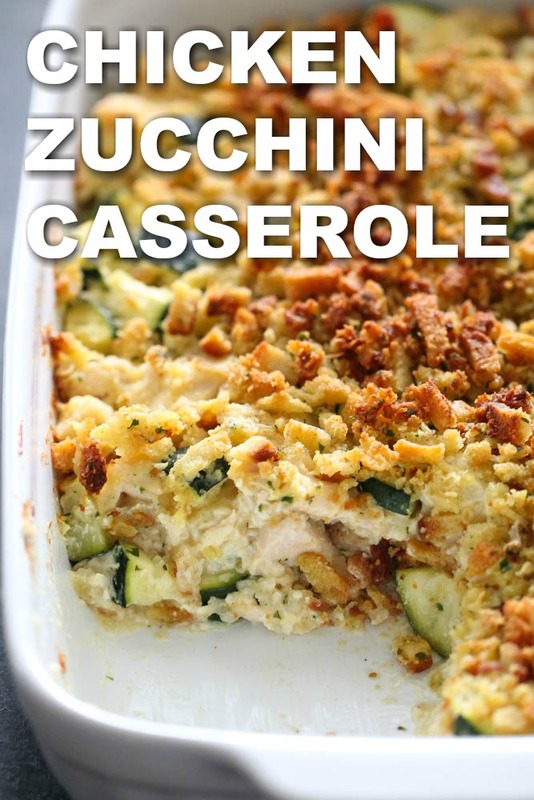 This Chicken Zucchini Casserole is a perfect weeknight dinner because it is easy to make and only uses a few ingredients. This delicious comfort food is made with chicken and zucchini tossed in a cream sauce and topped with stuffing and cooked to perfection. 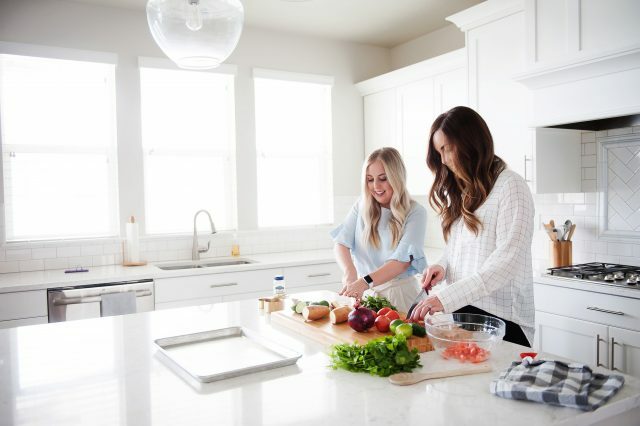 As a mom to four picky eaters, I’m always looking for easy recipes that my kids will actually eat. One of my sisters recommended this recipe to me and it was a hit! Even my busy toddler had seconds! I actually made this casserole earlier in the day by preparing it according to the recipe below and then kept it in my fridge until dinnertime and baked it before it was time to eat. It turned out great. The zucchini was perfectly tender and the sauce with the chicken was so delicious. This easy chicken casserole can be made in 10 minutes or less, especially if you have chicken that is already cooked. I love using a rotisserie chicken from the deli for this recipe to save me time and add a savory flavor. You can make this casserole in the amount of time it takes for your oven to heat up, so let’s get started! Step 1: In a large bowl, combine the stuffing mix and melted butter. Mix until well combined and then set 1/2 cup of it aside to use later as a topping. Step 2: Add zucchini, cooked chicken, cream of chicken soup, onion and sour cream to the large bowl with the stuffing and mix until combined. Step 3: Spread zucchini mixture in an even layer in a 9×13-inch glass pay sprayed with nonstick cooking spray. Step 4: Sprinkle reserved stuffing mix on top and bake at 350 degrees, uncovered, for 40-50 minutes or until cooked through and the top is golden brown. Large glass mixing bowl: I use this glass bowl for just about everything! It’s big enough to use to make cookie doughs or cake batters in but looks good enough to use as a serving bowl for salads. 9×13-inch glass baking dish: I have used this same pan since I received it for my wedding over 10 years ago. It washes up so nicely in the dish washer and I love that it has a lid for easy storage and transport. Rubber spatula: These are the best rubber spatulas for cleaning the sides of a bowl. They are heat resistant, stain resistant and can be thrown in the dishwasher to be cleaned. 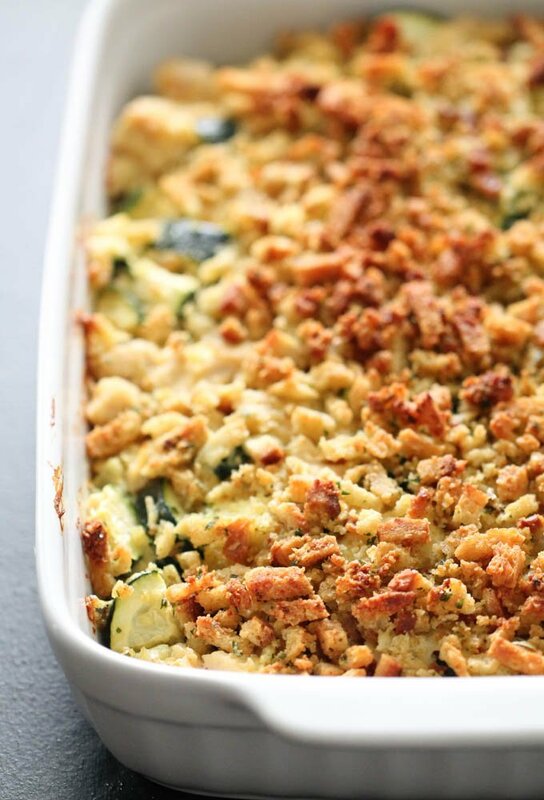 This Chicken Zucchini Casserole is the perfect weeknight dinner. In a large bowl, combine the stuffing mix and melted butter. Set aside 1/2 cup of the mixture for topping. Add zucchini, cooked chicken, cream of chicken soup, onion and sour cream to the stuffing in the large bowl. Spread zucchini mixture in an even layer in a 9x13-inch glass pan sprayed with nonstick cooking spray. Sprinkle reserved stuffing mix on top and bake, uncovered, for 40-50 minutes or until cooked through and the top is golden brown. Yes 1/2 cup!!! So sorry!!! Hi! I'm from philippines. what is stuffing mix? It is dried bread that is cubed and has seasonings added to it. It is boxed stuffing, cubed bread & cornbread, dried vegetables & seasonings. Do you make the stuffing first and then add to it? Or do you just put the stuffing ingredients in the bowl? The recipe says 12 cup sour cream......is that supposed to be 1/2 cup? This looks awesome! I want to make it tonight but im wondering if its supposed to be 12 cups of sour cream or 1/2 cup??? Thanks! I think you're missing a slash on the sour cream measurement. It should be a 1/2 cup of sour cream right? 12 cups of sour cream? Is that right? Looks really good! No.. it is only 1/2 cup of sour cream!!! No, you don't have to cook it! yes! 1/2 cup of sour cream! Looks great -- thanks for sharing. May try with Panko bread crumbs instead of Stove Top. Curious about the sour cream measurement too. 1/2 cup of sour cream and yes I'm sure panko bread crumbs would be great! Like the previous comments, could you please confirm the amount of sour cream? I make a casserole very similar with squash. It is definitely a family favorite! Only 1/2 cup of sour cream! 12 would be horrible!!!! LOL on the sour cream. Please confirm actual amount - can't wait to try! 1/2 cup of sour cream!!! Has anyone made this??? I SO want to but I'm not sure about the sour cream. I just made this tonight. I substituted 1/2 cup plain Greek yogurt for the sour cream. It was delicious, very easy and light. Even the kids went back for seconds. I was wondering about this right away, thanks for confirming that the GY works well! I made this today and used 1/2 cup sour cream. It was great! I will make it again!! There is a recipe on tasteofhome.com very similar to this recipe & it calls for 1/2 cup of sour cream. It also included chopped onion & one shredded carrot. I too noticed the 12 cups of sour cream, definitely a typo!! Have you tried making this without stuffing? We have only made this recipe with the stuffing. The stuffing is a lot of the flavor. From South Africa. What is "stove top stuffing"? Stove Top is a name brand package of seasoned dried bread crumbs. A box is approx. 6 ounces. It is boxed stuffing/dressing mix. You can use any brand. Stove Top is the name brand we used. It comes in a 6 ounce box. I am wondering the same thing! Best way to cook the chicken in advance. Hi Christine! We often buy bags of frozen chicken breasts and thaw the amount needed and boil them in water. It takes about 20 to 30 minutes to cook through when boiling them (depends on the size of your chicken breast and how thick it is). For 2 cups of cooked chicken you need about 1 1/2 pounds of chicken breasts. Chicken breasts come in so many sizes. If they are good sized maybe 3. But you will probably need around 4. Hope this helps! Its really easy... just get a couple larger boneless chicken breasts.. cut into bite sized pieces and put in skillet on stove w a small amount of water.. let simmer.. it will turn white completely thru when it is fully cooked. this is a great way to start chicken for a lot of recipes.. once you have it cooked you can save it in the fridge or continue w your recipes.. hope this helps! Im going to try this for dinner tonight! A small rotisserie chicken from the grocery store would be fast and easy. What are the estimated calories for a serving of this? Actually, if you hit the "magic" button, it says there are 471 calories per serving which sounds about right to me. Hi Leesa, just click on the MAGIC button under the picture and then click on NUTRITION. That will give you all of the nutritional info on this recipe. Look for the magic button on all of our recipes! Do you think there a way to convert this to a slow cooker recipe? I thought I would ask for your expert opinion before wasting a bunch of food, if it fails. Thanks! Looking over the ingredients, everything should be fine in the slow cooker. Your chicken would still need to be precooked. Cook on low and watch closely. Where we haven't tried it in the slow cooker, we don't have an exact cooking time for you! Do you cook the stove top stuffing first? Or use it dry? This was delicious!! I was so surprised at how much flavor it has. The only change I made was adding some shredded cheese to the zucchini mix and to the top. It was enjoyed by all. Thank you for a great recipe. I made an extra to freeze. For the gal who asked about slow cooking it. I would not recommend that, personally. What makes it so good is the crunch on top. Also, the zucchini holds its form and is not squishy. It tastes like broccoli cuts. Slow cooking it would turn it to mush. This is a five star recipe!! Thanks Beth for the heads up on the zucchini if it's cooked in the slow cooker! This was so so good! Next time i make it i am throwing in some sliced mushrooms! Would it be ok to use squash rather than zucchini? We haven't tried squash, just zucchini squash! Sounds delicious though! Let us know how it turns out. I do this recipe every late august with summer squash and zucchini mixed because I have sooo much from the garden. Turns out great! This looks amazing, my friend!!! Can you give me the measurements to cut this recipe in half? I would love to make this, but do not need it to serve 6, thanks! Just use half of each ingredient and use a smaller baking dish. Your cooking time may be reduced a little too so watch it closely. Thank you, can't wait to try his recipe! Do you think this would be good as a freezer meal? I was wondering the same thing and about to ask! :) I would think so, but would love another opinion. I'd probably put the 1/2 cup topping in a separate bag though. I made this tonight and also substituted the sour cream for greek yogurt and it was great. I think this would be hard to freeze but perhaps the sour cream would bind a bit more and would make it easier to freeze than the yogurt. I will definitely make this again and think next time some chopped carrots would be a great addition. A bonus was that my kids willingly ate the zucchini! What are the calories in this dish? Hi Melanie, just click on the MAGIC button under the picture and then click on NUTRITION. It will give you all the nutritional info on this recipe. You can find the magic button on all of our recipe. It's our new sister site - MyRecipeMagic.com. It's a great place to look for recipes. We have over 30,000 from bloggers and chefs! About how many zucchini equal 4 cups? That would depend on the size of your zucchini. If they are small, you might need 6 to 8. If they are good sized, you may only need 2. How big is your zucchini? I'm sure you can judge it! I made it from a HUGH zucchini the other night. I do not like those big ones! I scooped out the seeds. My recipe was so old! It asked for 8oz. of stuffing mix! That would depend on the size of your zucchini. If they are small, you might need 6 to 8. If they are good sized, you may only need 2. I agree with you, I don't like to use the huge zucchini. Just small to medium ones! But they all work! Wow! Made this tonight. Hubby and I both loved it. Added a little garlic. Think I might add carrots and mushrooms next time, but it was great just like it was. This recipe is definitely a keeper. Anxious to make this recipe. So many recipes that call for cream soups do not specify if the soup is used just as it comes out of the can or if it is to be mixed with the required liquid listed on the can and I'm never sure what to do! I make this recipe with broccoli. Simple yet yummy! We haven't made it without sour cream. It only asks for 1/2 cup, so it should be ok without it since you don't like the taste of sour cream. Prepare the stuffing or just use the contents? Don't prepare the stuffing, just add the dry stuffing mix. How many times do you have to answer the question about the amount of sour cream? C'mon ladies. Of course it is 1/2 cup!! Am trying this tonight....looks good. Stars will not go higher than three on my iPad. This recipe sounds very good and I will be making it shortly but I was also wondering if it is a recipe that can be made ahead and frozen? I made this yesterday after finding it on your site. I added some chopped bell peppers and substituted plain yogurt for the sour cream. I used the cranberry Stovetop dressing. It was so good! Thank you! My mom has an abundance of monstrous zucchini in the summer, so I'm always looking for new zucchini recipes. This is great! All I had on hand was cream of mushroom and it was fantastic! Thanks for the delicious recipe, will definitely make again! Can I. Make this gluten free? Suggestions on a topping that is gluten friendly? We have only made this recipe as directed in the recipe. For a GF topping in place of the stuffing, Rolled oats can be a substitute for breadcrumbs and a sprinkle of herbs and some Parmesan cheese for flavor. What gluten free topping could I use instead of stuffing? How about some crushed up corn or rice chex? I made this tonight and OMG! This is my new favorite dish and I didn't change a thing. Making this for 2nd time in a week. Delicious! Adding a little garlic, broccoli and some mushrooms. I cooked my chicken in olive oil and added some seasonings. So many things you can do with this recipe. 5 stars. Do you prepare the stove top or use it dry? Use the stove top dressing mix dry. I made this last night! It was delicious!! I doubled it and froze the uncooked portion. I had to cook it a little bit longer because my "diced" zucchini was a little big. I might add some broccoli next time. Winner in my book. *I double the recipe b/c sour cream comes in a cup and the other half of the onion will go bad. Did the one that was froze turn out? I'm thinking of doing that. How did the frozen dish turn out? I'm looking for freezer dishes that doesn't involve crockpot...I'd love to give this one a try! Just add the dry stuffing mix and the melted butter together. Do not make the stuffing as directed on the package. made this the other night and it was wonderful! will definitely be making this again! I made this for supper this evening & I think it is a new family favorite!! I did however add some hidden valley ranch powder to it. Super easy recipe & we all really enjoyed it! Thank you for sharing!! Loved it. I did substitute greek yogurt for sc. I also added some celery. I used 1T of the 1/2c of butter and microwaved the celery and onions for a minute before adding them to the mix. Will definitly make again. Can't wait to try this - looks delish! We substituted pepperoncini for onion and added parmesan in the mix and on top! SO GOOD! Fabulous!! Eating it now and we all love it! I'm not much of a casserole person but this was awesome. Used wild turkey my husband got instead of chicken. Yum!! Love this... I added chopped red potatoes. One bite taste like thanksgiving. Only thing missing was the cranberry sauce. Can this be made in advance and frozen? If so, what temperature and duration would you cook it at? Thanks! Has anyone tied this with frozen zucchini? Wondering if it turns out well. Great tasting casserole! My picky boys gobbled it up and one even asked to bring the leftovers for lunch the next day! That is a first! Husband loved it too! Thank you for a great recipe. Will be adding this our rotation. How do you think this would freeze before baking? Also, I'm the youngest of 8 kids, with 5 sisters! We all love to cook and had an excellent teacher (our mom)! Made this, everyone LOVED it, even the children including the one that does not love vegetables. He said "awesome". Will make again this weekend, two in fact. Wondering if I could make ahead of time at all or freeze. Hi, is it okay to bake this dish in a foil pan? i'm making this for someone else. It should work fine in a foil pan that's close to a 9 x 13 inches. Can I vacuum pack and freeze after cooking? We haven't tried this as a freezer meal so we aren't sure if the zucchini would go soggy or not. So, with the stove top stuffing do you also use the packet of veggie/seasoning that comes with it?? With Stove top it's all mixed together, so we add the whole box. So simple and tasty. I followed the exact recipe and we devoured the entire dish. Will certainly be making this one again. Thank you. Made this dish for dinner last night and was delish! The stove top gives it so much flavor. I think it would also be good with broccoli. My husband and I both loved it. Took awhile to prep since I had to cook the chicken but was well worth it. Our large family wiped this dish out this evening! Lovely simple casserole! Thank you! I made this tonight and it was amaaaaaazing!!!!! I opted for Holden mushroom soup instead, used sautéed onions and added a pinch of garlic and omg it was to DIE for!!! I love this recipe! I have made it several times, it's a big hit with the family! This recipe is FABULOUS and soooo easy to make with stuff I always have in my pantry!!!!! I like the idea of being able to use other veggies (squash, carrots, broccoli) if do not have zucchini. Next time I am going to have to double the batch so there are more leftovers for me and my son to take to work. This is also a good recipe for people who are just learning to cook like my 20 year old son who is getting ready to move to campus. We have never made this recipe with Quinoa. can i use italian style breadcrumb..coz i only have a large box of that.. I made this recipe the other night but I added a few of my own ingredients and it was AMAZING! Such a great way to include really healthy foods that the kiddos wouldn't normally eat! Thank you so much for sharing. I used avocados instead of zucchini and topped it with mozzarella was awesome. 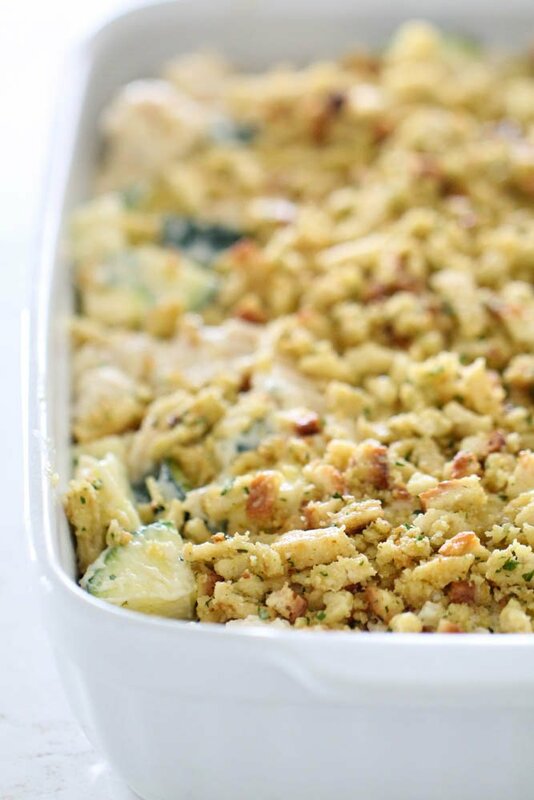 I have not made this casserole yet but planned to make it for Thanksgiving this week. As a tried and true southern girl I never had stove top stuffing. That was always considered "a false version of cornbread dressing." Of course over the years I have had the stuffing in a variety of different casseroles and loved it. When I saw the suggestion of avocados it reeled me in as my family loves them. Will let you know how it goes after Thanksgiving. Hope all have a safe and blessed Thanksgiving day and weekend. Could you replace the stuffing mix with cooked rice (not for the topping)? Would about a cup of rice be right? Thank you for sharing this recipe! I was looking for an easy casserole dish and sure found it. My husband loved it so much that he's asked me to make it a 2nd time this week. This time I'm doubling the stuffing because we both LOVE stuffing. SO GOOD. Thanks for making my culinary skills appear even more wonderful in the eyes of my husband. Thanks so much for this recipe. With zucchini coming in strong in the garden, I needed to find something new to do with it. The recipe sounds great the way it is so going to give it a try tonight. Almost all of the reviews have been great; Cooks like me out there always trying something new. Bon appetit! I made this over the weekend for my family of 5 picky eaters, there wasn't a crumb left! My youngest, who won't eat anything that might be a veggie, has asked me to make it again this week! This ill surely be in the dinner rotation! Just made this tonight - so delish! Will definitely make it again. Whole family loved it! Do you have any advice on how to translate cooking this casserole in the oven to cooking it in the 9x13 casserole crock pot? LOVE the sound of this recipe! Pinning and making soon! This looks terrific. In addition to adding mushrooms, carrots and cheese, I am thinking of added slivered almonds or water chestnuts for additional crunch. Made this last night for my daughter and I. I used squash and zucchini since that's what I bought from the farmers market last weekend. The recipe is very easy and was very good. Adding to my recipe book. This recipe sounds so delicious and I am with you about loving the craziness of this time of year! Time to bust out the casserole and crockpot recipes! For some reason I was hesitant to try this recipe at first, but I needed to use some zucchini, and I do love stuffing. I've made it several times now and love it! I made this with a few adaptions...I used zucchini like the recipe called for, but also used yellow squash and carrots just to add variety and more nutrition. I threw the veggies in the food processor using the blade attachment and gave a few quick pulses. In addition, I stirred in some parmesan cheese. It was a big hit! I think it might be good as a stuffing for portobello mushrooms too but haven't tried that yet. Would I freeze it before cooking it?? It should freeze fine before cooking. Your chicken is already cooked. Just thaw and cook according to directions. Check it as it cooks to be sure all is going well! This was so good. I added mushrooms and used about 5 cups of zucchini. I left it on the counter to cool after dinner and my husband kept taking "just one more bite". Starting WW on Monday so the next time I make it I am going to try to lighten it up with Greek yogurt and something in place of the butter....but it was absolutely delicious as written. Thank you! Had to share this....I made a different casserole for dinner last night and my husband said "It's not as good as the last one you made. I could eat that 7 days a week!". So I'm making it again tomorrow. I don't have boxed stuffing, is there a way to recreate it? I can toast some bread but what herbs are in the boxed stuffing? Anything else? so your recipe states to precook the chicken i know when it cooks in the Oven it would cook the chicken. My family loves the stove top chicken veggie recipe found on their boxes and it does not require precooking the chicken. so i guess my question is would it hurt to make this without precooking the chicken and has anyone tried it that way? What can you use instead of Stuffing? My hubby can't have bread products. Eeek! 1 stick of butter? My thighs can't handle it. What's a good substitute ingredient? Can I use half the amount instead and replace it with milk? You could try cutting the butter in half. Look at your stuffing box mix and be sure to add at least what it calls for. Do you use chicken- flavored stuffing or traditional sage? We used the Chicken flavored stuffing. One of my kiddos has a dairy allergy so I used homemade cream of chicken soup (made with almond milk) and Tofutti Better Than Sour Cream Sour Cream and it turned out great! A nice dairy free option! My husband couldn't even tell it was dairy free.? Made this tonight and it was delish! Great recipe! Can I make this up ahead of time and pop into oven the next day? Sure, it should be fine covered and refrigerated until ready to cook. Made this for dinner tonight and it was delicious!! Will definetly make this again!!! Hello! How about putting uncooked chicken in this, and baking as called for? Why precook the chicken? Thank you!! If you put uncooked chicken in this with all of the moist zucchini, it would be a gooey mess. It basically needs to be heated through and the zucchini cooked. Mine is in the oven !!! It looks so yummy ? I can’t wait to have some !!! I will post after dinner. Thank you for sharing ? Would this be an okay recipe to make a couple of days in advance and not cook right away? Would you recommend sauteing the vegetables beforehand if that were the case? I love this Kim! Thanks for sharing. We totally believe in using what you've got. Have a great day!! Trying this tomorrow! I bought a rotisserie chicken. Love the convenience. How many cups of chicken would you think I should use?